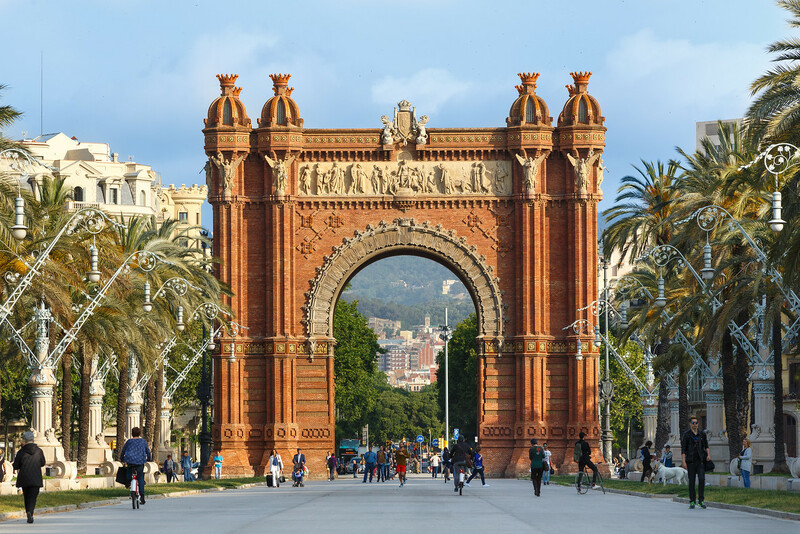 The Arc de Triomf, a beautiful landmark that helped me find my bearings on my second trip to Barcelona. Sometimes it takes awhile to get familiar enough with a new location to have any idea where I’m going. This portion of the city is full of landmarks like this beautiful gate to the 1888 World Fair and now the park downtown. I recently had the opportunity to travel to Barcelona, Spain on a work trip taking event photos. Barcelona was an amazing trip in many ways, including an amazing amount work but also such an adventure being in a foreign country and seeing new sights. Worked with an top-notch team of people and interacted with some great clients throughout their event. I hope to share a few scenic photos over the next little while as I have time to pull out a few photos I took for myself while there. This specific photo was from the first morning in city when I was asked to walk around the nearby locations and gather some scenic photos of the locale for the attendees. Rough assignment, right? After being awake for 36 hours straight due to a restless passenger next to me on the transatlantic flight, getting up at 6am didn’t sound all that enticing. Still, I’m glad I was able to get out and see some of the sights right off. I did end up walking 5 to 6 miles that morning which was a bit taxing considering I’d end up being on my feet for the rest of the day and evening! 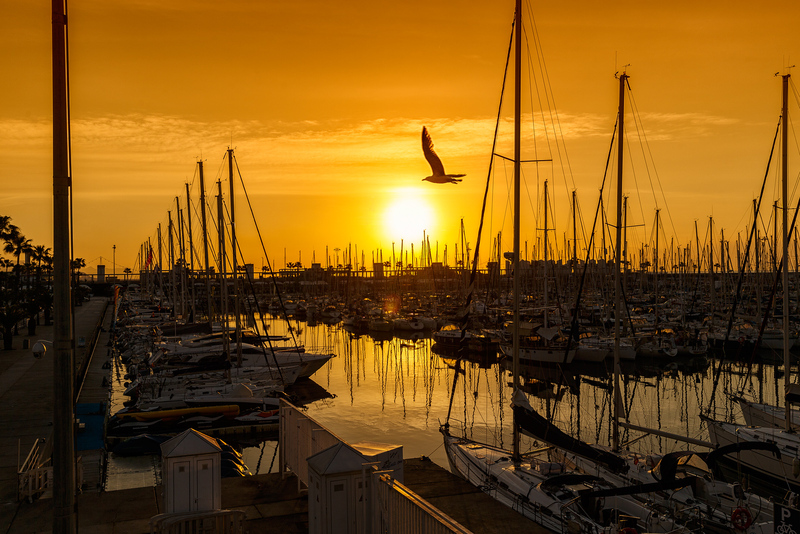 The morning sun was beautiful and the marina provided some interesting foreground elements along with the gull I waited to fly into the scene. Traveling to new places is always so interesting, usually providing unique scenery, architecture and beauty. But sometimes finding something familiar in a coastline and a bit of nature is exactly what the soul requires. Some creative concepts are worth revisiting, especially when they involve collaboration with other artists and a style that results in new looks with every frame. I’ve grown to love painting with motion in long exposures, and dancers are a perfect fit for the genre. Wow, 25 years of amazing a cappella music from this great group. BYU Vocal Point has been a part of music we’ve enjoyed since, well, back when I was still in college and they were a new group. The band members change as they graduate and fresh talent comes in, but the entertainment value and skill continues on. You can see some of their music and video productions on YouTube. Last week I had the opportunity to visit a Grizzlies hockey game in the Maverick Center in Salt Lake City, Utah. My daughter’s school choir was singing the National Anthem and so of course I took my camera, an extra kid and a strong stomach for some bad concession food. We had the bright idea (see what I did there) to do a series of photos with the new chalkboard wall in the studio for the Create LDS Media program in which I participate. I was joined by another great photographer and a whole host of kids to explore the idea. We quickly learned that a bunch of kids, a huge chalkboard wall and too much chalk leads to a little bit of chaos, but in the midst of that we were able to make some fun photos. It’s that Christmas time of year again, so I made my way up the day after Thanksgiving to get the first looks at the lights on Temple Square in Salt Lake City. I’ve captured these lights for 6 or 7 years straight, mostly for fun and sometimes to share with the Mormon Newsroom to potentially use in their news releases. It’s always fun, and much warmer this year than in years past. Some time ago I started bringing in friends and willing victims subjects to the studio for various kinds of portraits. My goal has been to experiment with new lighting, compositions and simply to keep sharpening the saw so to speak. I find when I go too long without doing a particular kind of photographer, those skills dull and I have to relearn some things that used to be second nature. Personality portraits are one area I really enjoy and want to keep exploring regularly. Neon Trees played a free concert recently in Provo, Utah. Though I’m friendly with one of the organizers (Justin Hackworth, a quality photography and great guy), I knew that nearly every local photographer would be lobbying for a chance to get in close and do photos. I could have pushed myself to the front, but instead decided to enjoy the concert a little differently. So no close up shots for me, instead I wanted to capture the size of this event. I’ve had some unique experiences in my photography efforts. This week I was invited to assist as an event photographer at a movie premiere where I happened to run into some of the Osmonds (among many other popular personalities) that brought back to mind my experiences with them. Back in 2008 I had the chance to go on tour with them in the UK for a few weeks, traveling on the bus as a tour photographer to produce a tour book they could offer to their fans. It was an amazing opportunity to document the goings on during the tour, both on stage and behind the scenes.